Abigail Zapote immigrated to the United States in 1997. Her undocumented status sparked her interest in social justice that would later become her labor of love in her early adulthood; as she herself lived the trials and triumphs involved with living in the United States as a DREAMER. Fortunately, after fourteen years, Abigail was granted U.S. residential status, and is presently on her way to becoming a full citizen. Abigail attended the University of Texas at Dallas, where she received her Bachelor’s in Political Science. 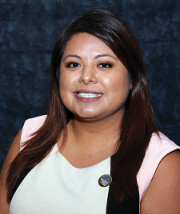 During her studies at UT Dallas, Abigail joined the League of United Latin American Citizens to participate in the organization’s social justice, civil rights, and political mission to improve the prosperity of Latinos in the U.S. She now represents the Collegiate and Young Adult councils across the country on the LULAC National Board. Abigail began her professional career upon graduation working at her alma mater in the Office of Diversity and Community Engagement. She was then catapulted into the world of U.S. politics as a campaign consultant in the Washington, D.C. area. Presently, Abigail has accepted a new role as the Executive Director for Latinos for a Secure Retirement in Washington D.C.